As of July 1, 2017, fees apply to food scraps brought to Drop-Off Centers when not brought in with household trash: Learn more. 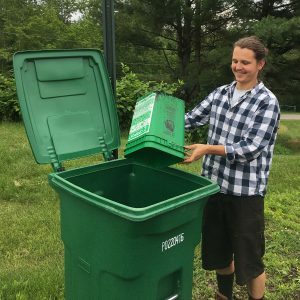 Drop-Off Composting is available at all CSWD Drop-Off Centers and Green Mountain Compost for residents and qualifying businesses (see Limits). For more information for businesses, see Composting for Businesses. The Drop-Off Composting program is limited to 30 gallons of food scraps per customer per day at any CSWD Drop-Off Center. Customers with larger volumes should contact Green Mountain Compost at (802) 660-4949 for more information. Fees apply. 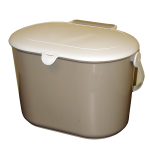 You can also buy a convenient 2-gallon counter-top bucket for $5 at Green Mountain Compost. Review our list of items accepted in drop-off composting before you start. For easier cleaning, line the bottom with newspaper, a used paper bag, or use an approved compostable bag. See “Tips for maintaining your compost bucket” below. Bring your food scraps to your nearest CSWD Drop-Off Center, or take them to Green Mountain Compost in Williston. The scraps we collect in this program are taken to the Green Mountain Compost processing facility, where the piles quickly reach and stay at temperatures of at least 145°F. 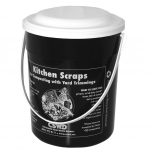 Because these high temperatures kill any undesirable organisms and break down even tough materials like bones and corncobs, the drop-off composting program can accept a wider variety of items than most backyard compost bins. Please consult the What is Compostable? page of the Green Mountain Compost website for details on everything that we can compost. Please do NOT put anything other than paper or food scraps and plant material into the compost cart. Conventional plastic bags must be emptied and placed in the trash. Try lining the bucket with paper towels, newspaper (no glossy inserts or magazines – the inks can contain heavy metals), a plain brown paper bag, or a compostable plastic bag. You can dump these lining materials right into the compost cart at the CSWD Drop-Off Center. 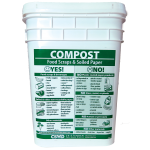 Green Mountain Compost carries EcoSafe compostable bags in 2.5 gallon and 8 gallon sizes. Many online vendors carry certified bags in a range of sizes; one reliable online source CSWD has used for larger sizes (13 to 96 gallons) and quantities is buygreen.com. Each time you add food scraps to your collection bucket, add a layer of black and white newspaper, brown paper bag or paper towel to reduce odors and to discourage fruit flies. Keep food scraps in a specially marked container in the refrigerator or freezer until you bring food scraps to the CSWD Drop-Off Center. In cooler weather, place your sealed bucket outside. At certain times of the year (usually summer & early fall) fruit flies can be more prevalent. Other insects may be attracted to your compost as well. One of the best ways to keep the flies away is to cover your bucket tightly when not adding food scraps. Wood shavings and sawdust from “Clean Wood” (e.g., NO plywood, particle board, pressure treated wood or wood that has ever been stained or painted) are also a good item to have on hand to layer on top of food scraps to discourage odors and fruit flies. Gerbil/hamster cedar bedding is inexpensive and works well to use as a layer for compost collection buckets. Note: Paper cups should go in the trash; they are coated to retain water.